Amanda graduated from Brown University in Providence, Rhode Island, with a B.A. in Development Studies, and an M.A. in Environmental Studies. While there, her research focused on environmental planning and community change. As our bodies are our first and most immediate environment, becoming a Rolfer™ was a clear — if less usual — transition for her. 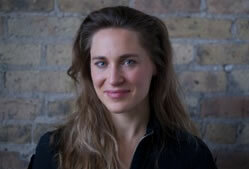 Amanda first came as a client to Rolfing® when, at twenty years old, she felt like she had lost a basic sense of grace. Although physically fit, she no longer experienced the ease she had in her body prior to a spinal fusion surgery and subsequent months in a body cast during her teens. Again and again, people told her to “get used to it” or “it’s only down hill from here”. Years of dedication to dance, gymnastics, diving, and cycling had instilled in her a basic belief in the body’s resilience — its capacity for both agility and strength as well as, ultimately, its ability to metamorphose. Her first Rolfing series served to deepen this belief. Through it, she not only recovered what she felt she’d lost, but developed more refined somatic awareness and embodied subtlety. The experience inspired her to learn Rolfing so that she might catalyze the recovery of such possibility for others. Today, she delights daily in facilitating this work of transformation for people of all ages, body types and walks of life. Amanda enrolled at The Rolf Institute® of Structural Integration (RISI) in Boulder, Colorado. In early 2002, she finalized her clinical studies in Munich, Germany through the Institute’s continental counterpart, the European Rolfing Association. She achieved her advanced certification in 2005. Amanda regularly pursues continuing education in, amongst other topics, visceral manipulation, pediatric Rolfing, spinal and pelvic mechanics, and functional integration. She participated, as a committee member, in the drafting of RISI’s current Standards of Practice from 2007 until its passage in early 2010 and served on the RISI’s Faculty Development and Review Board during 2008-2009. As her inquiry into the curious state of being human deepened, Amanda enrolled in the four-year, full-time medical program at Chicago’s Pacific College of Oriental Medicine — all the while maintaining a thriving Rolfing practice. A Doctor of East Asian Medicine, Amanda is a licensed to practice acupuncture in Illinois and nationally board-certified by the NCCAOM to practice herbology. Amanda further serves her profession as an elected member of the board of directors for the Illinois Association of Acupuncture and Oriental Medicine (ILAAOM) since spring 2016 and an active member of its Legislative Committee since spring 2015. During the clinical aspects of her training, Amanda was a practicing intern at Pacific College’s onsite clinic as well as the Chicago Women’s Health Center, a health collective that provides outstanding gynecological care on a sliding scale basis to the women of Chicago. Her doctoral observership took place at North Shore Associates in Gynecology and Obstetrics. She completed two doula trainings — one through DONA International in 2002 and one through ALACE in 2004 — as well as continuing education related to safe, supported, and celebratory birthing – one amongst many possible rites of passage amidst a human lifetime. In 2008, Amanda volunteered for five weeks in East Africa where she co-facilitated trainings for local health-workers in simplified acupuncture protocols that could be applied to treat village health concerns. The intersection of medical cultures — conventional allopathic, homeopathic, traditional East African, traditional Chinese, and more — gave her a palpable sense of the tremendous potential for collaboration available to meet the global health challenges of our time. It further solidified her observation that East Asian Medicine has a powerful role to play in preventative care and public health. In subsequent years, she volunteered locally and then in Kathmandu, Nepal with Mindful Medicine Worldwide, an organization that aims to fortify access to integrative primary care in underserved communities worldwide. In late summer of 2009, Amanda traveled to Columbia County, NY where she completed a botanical studies intensive that provided her with a vivid, hands-on, straight-from-the-soil sense of the medicine she practices. It also enhanced her gratitude for pioneers who were already hard at work to begin the long process of righting the enormous carbon footprint of shipping herbal medicinals from halfway around the globe. Her strong passion for “greening” her profession guides her to make earth-friendly choices for her practice daily and also inspired her to found Inner Ecology™, a custom herbal formulation service, which provides medicinals of exceptional quality to patients of her practice at Inner Architecture as well as to those of board-certified herbal clinicians nationwide. A registered Benefit Corporation, Inner Ecology takes its social and ecological mission seriously as it works to re-root this ages-old medicine smartly, safely, and sustainably into North American soils for the benefit of patients and the planet alike.